About more than bathrooms, these bills also effect wages, employment and immigration. Fayetteville NOW is cosponsoring this excellent program featuring Rick Glazier, Executive Director of the NC Justice Center (NCJC), and Jimmy Buxton, Fayetteville NAACP Branch President. People all over the country have heard of HB 2, filed by the NC House, ratified by House and Senate, and signed by Governor McCrory in less than 12 hours during a ‘special session’ on 3/23/16. Misleadingly titled the Public Facilities Privacy & Security Act , the interference with local ordinances on bathrooms (and targetting an already extremely vulnerable population) is only a small part of the damage it has done. 2015 bill HB318 targets immigrants and poor people and veterans. The January to April 2016 newsletter is full of statewide news and important national events. From the press release about how HB 2 is DISASTROUS for women, to a look at status of the Supreme Court of the United States, to our upcoming ERA-NC Alliance event on Apr 12, 2016, to events we had in March with national feminists Ellie Smeal (Ms. Magazine/Feminist Majority) and Terry O’Neill (NOW), to a statement on what happened with Melissa Harris-Perry! Take a look! Here are some pictures from the press conference. See the diversity and the number of organizations represented. I am still hoping for a link to the speeches. 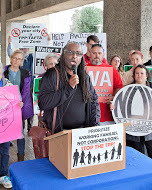 Join a coalition of over 40 organizations at Congressman Butterfield’s ‘State of the District Address’ to emphasize how harmful Trans-Pacific Partnership (TPP) is to women and the 99%. Our coalition of over 40 organizations (including NC NOW) has been trying to meet with Congressman BK Butterfield about TPP . So far, he has not agreed to meet on TPP with the coalition, nor has he met with people who live in his district. We’re taking this opportunity to show how important TPP is to so many people and organizations. Picture of coalition at 2/4/16 press conference which was held underneath Rep. Butterfields office building. This was the turnout despite the rain! Meet at Durham Tech in Durham at 5:30 in front of the Educational Resources Center for an event that goes from 6-7p.m. Fayetteville NOW announces its sixteenth annual Susan B. Anthony Birthday Reception! Join us at the VFW Post 6018 in Fayetteville on Thursday, Feb 25, 2016, 5:30pm-7:30pm. Join us at a press conference on Wednesday, Feb 3, 2016, at 10am to show your OPPOSITION to the Trans-Pacific Partnership (TPP) trade deal. Speakers will highlight how TPP will hurt the people of North Carolina, and how past trade deals have already hurt North Carolinians. Trade deals like the North American Free Trade Agreement (NAFTA) and the Central American Free Trade Agreement (CAFTA) have been great for corporations but terrible for too many of people in the involved countries. The advantages for U.S. corporations is clear – to move production to countries that pay lower wages and have few regulations. The trade agreements also lowered or eliminated protective import-export tariffs on products crossing the border. Over the past 20 years, free trade agreements have served to disadvantage American workers and undermine domestic food safety in the US, but they have also stolen jobs and caused communities to fall apart in developing countries. When communities fall apart, it only gets worse from there. People may hear about the effects of instability in general (mass immigration to the US to escape violence and poverty in Central America, for example), and not realize instability can be especially worse for women. 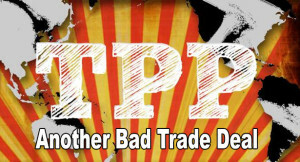 Event: What is TPP? Why should we fight it? The Triangle TPP Working Group and UNC Student Action with Workers (SAW) invite students, faculty, staff, and community members to a “TPP Teach-In” to inform you of the concerns of this dangerous trade deal and methods of citizen mobilization against it.